NOTE: This story is fiction based on news accounts. It does not contain factual depictions of any events from official sources. 10:17 Local (15:17 UTC), Monday, 7 October 2013, Administrative Offices, Triple Five Group, Mall of the Americas, Bloomington, Minnesota, United States. Bob Davis felt a chill race up his spine and down his arms. He saw his hands tremble on the desk in front of him. His ironic sense of humor kicked in when he thought, “Well, Bob, that’s why they call it terror-ism.” He looked at the two men sitting across from him, their mouths moving, but he didn’t hear the words for a second. He forced himself to tune back in to their meeting despite a feeling that this couldn’t be real. It was like walking onto the pages of a Clancy novel. 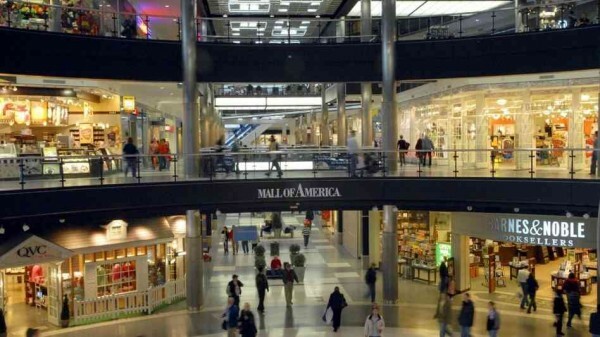 Bob Davis manages operations for the Mall of the Americas in Bloomington, Minnesota. Over the past eight years he has seen women give birth there, the most elaborate shoplifting schemes every devised (and busted), a ring of prostitutes operating in the mall and a coyote that somehow made its way inside the giant shopping center on a busy Saturday night. This was the first time he sat across his desk from two FBI agents getting briefed on plans for a possible Al Qaeda style suicide attack on his mall during Black Friday, the busiest shopping day of the year in the busiest mall in the United States. The two FBI agents pulled up a file on their tablet computer. “Our estimates of casualties here at Mall of the America in a Black Friday attack are between 400 and 800 killed.” Davis felt the grip of what an attack would mean. The country, the economy, Minnesota, his community, his tenants, his family, his job. He remembered the economic impact from the 9/11 attacks. He was 40 years old then, working for the Taubman Centers back in Michigan. They managed a large number of shopping malls around the U.S. The 9/11 terror attacks had gutted the company’s occupancy in the next five years when the economy tanked. And that hadn’t been a direct attack on a U.S. shopping center. What the FBI agents were describing to Davis now could sink the shopping mall industry in the United States. 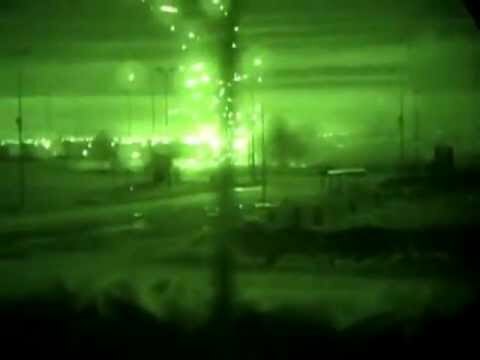 02:45 Local (23:45, 2 October UTC), Thursday, 3 October 2013, Camp Lemmonier, Djibouti-Ambouli International Airport, Headquarters, Combined Joint Task Force – Horn of Africa (CJTF-HOA). 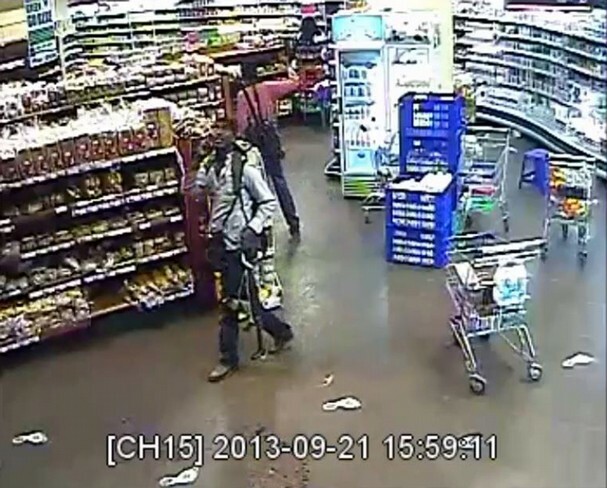 Nine men were arrested in Africa following the Kenyan mall attack. It took a few days for… the authorities… to extract information from those nine men. Taken one at a time none of them provided anything that seemed of much use. But each minor detail they provided, from how they paid for their meals to how they learned to use their weapons, began to congeal into a pattern. When that pattern was fit against the sides of other patterns, now electronically in a basement in Langley, Virginia, there was a horrific conclusion: The U.S. was next. Once that conclusion was reached the Director of National Intelligence was briefed. He briefed the President, a man deeply embroiled with a domestic political battle when Congress refused to approve economic changes forcing a shutdown of some government offices. The President and his staff were busy with, among other things, trying to manage the first ever White House online flaming campaign via e-mail and social media. Their target was Congress and their intent was to depict them as uncompromising and unreasonable. To his credit as Commander in Chief, when the briefing materials on the Nairobi attacks reached his desk, the President did not delay. He set the wheels in motion via Admiral William H. McRaven at MacDill AFB. McRaven is the ninth man to command the United States Special Operations Command at MacDill, a unified command that coordinates the training, equipment, doctrine and employment of all U.S. special operations units. McRaven’s units include some of the most sophisticated military intelligence gathering and analysis capabilities in the world. These operate organically to the special operations community, from the field around the world back to MacDill, largely for the purposes of mission planning. The strategic intelligence may flow upward from McRaven’s units, or downward from Langley, but flow it did, in both directions. When the intelligence McRaven’s units had collected was collated with the information garnered from the West Lake Mall attack in Kenya the picture was crystal clear. 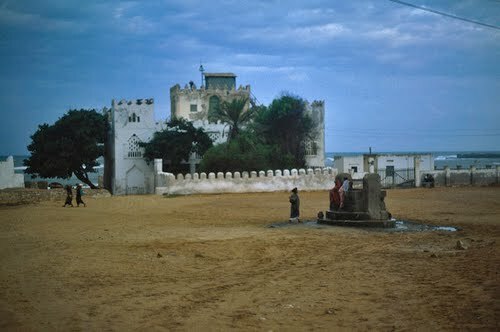 A big part of that picture pointed back to a beach house in the Somali coastal city of Barawa. Force Recon Marines from the Special Purpose Marine Air Ground Task Force 12 (SPMAGTF-12) at Camp Lemonnier, Djibouti, had been training local indigenous forces in the region. They also collected intelligence from them during training. Both special operations and CIA operatives joined the activities related to Somalia at Camp Lemonnier to help with data collection and facilitate better, more context-based interpretation of intel. SPMAGTF Recon Marines had even conducted beach reconnaissance of some areas of the Barawa, Somalia coastline. That hydrographic survey data, combined with signals intelligence, some limited HUMINT (human intelligence from operatives on the ground in the target area), satellite and drone images merged with data from the West Lake Mall detainee interviews. 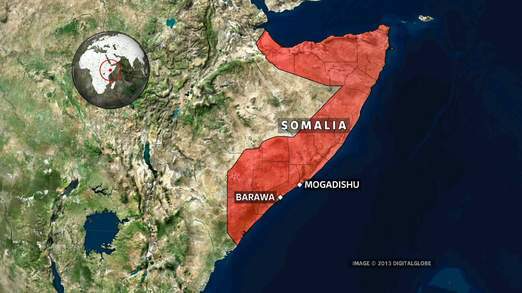 Back at Camp Lemonnier, at MacDill AFB in Florida, on a ship off the coast of East Africa and in Langley, Virginia, planners held a web conference to review the final plans for a direct action mission to interdict the capability of Al Shabaab to carry out their planned U.S. mall attack. It was Thursday night. The raid on Barawa was a “go”. 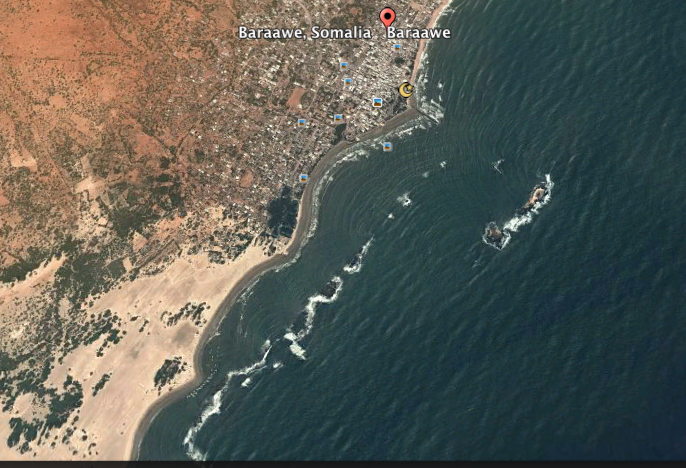 03:50 Local (12:50 UTC), Saturday, 5 October 2013, 473 meters off the coast of Baraawe, Somalia. High tide hit the rocky beach off Baraawe, Somalia at 04:38 hours under a dim, waxing crescent moon. Just before high tide the incoming tidal current urged the twelve combat swimmers of the Naval Special Warfare Combat Interdiction Group (formerly “SEAL Team 6 or “DEVGRU”) toward the rocky outcrops that lay just off the Somali coast. Swimming along the surface was easy; the black African waters were warm. High clouds filtered what little moonlight there was. The assault team had left their F470 CRRC boats almost 2 miles off shore to prevent visual detection of the assault boats from land. The boats used sound suppressed motors that were extremely quiet. After dropping off the combat swimmers the rigid inflatable boats immediately turned back out to sea for recovery on a U.S. Navy ship that was even now steaming back toward the coast after the insertion. The first element of the combat swimmer/assault team would hit the beach, remove their swim fins and floatation vests then cross inland on foot less than a kilometer south of their target, a large beachfront villa on the southern edge of Baraawe. They would turn immediately north toward the objective. This first six-man element of the team moved inland approximately 400 meters toward the concealment of low scrub. The other six-man element lay prone in the gently lapping waves of shallow water just off the beach until the flanking assault element was in place. A series of clicks on their updated, secure AN/PRC-126 radios would signal the first assault team was in place. Then the two teams would move toward the target, a two-story villa where the objective, a high value personnel target named Ahmed Abdi Godane, was supposed to be located. The two elements of the assault team were in place. The wind was gentle coming just barely off the ocean, it was 71 degrees Fahrenheit. The sun would not rise for another hour and forty minutes. Each member of the second assault element heard the clicks in their headset when the first element got into position. They responded with a single click of the mic button. Then each team member checked right, then left, clearing his field of fire and began a low, quick advance across the beach, trending right or north to the target. The building was surrounded by low walls on three sides and a high wall at the back. It made sense to go over the lower sections of the walls, enter the courtyard section, assault any threats that were providing security and then conduct the entry. Once the entry began, speed and violence of action was their primary tactic. They had to overwhelm what security may be in place quickly, assault the target building and secure the objective, detain Ahmed Abdi Godane or neutralize him, then exfil the target area. The primary extract route was by helo extraction near a defensible LZ south of the target area. The secondary extract was back out to sea. Overhead surveillance by an RQ-170 Sentinel drone would provide a live video feed to the command center back at MacDill and help give the Naval Special Warfare operators on the beach a high degree of situational awareness via radio. What the Sentinel video showed now was troubling. There were more personnel between the insertion point and the objective than normal. Within the walled compound itself, no less than eight hot targets could be seen, some of them milling around from target to target as if they were spreading information. Outside, there were more than ten hot spots between the insertion point at the beach and the objective. The insertion would almost certainly involve contact earlier than they planned. A common feature of operations in this region is that its difficult to tell who is a combatant and who is not from overhead surveillance. The hot spot on the drone feed may be a fisherman rigging his boat to go out at first light, or an insurgent walking a security perimeter armed with an automatic weapon and grenades. Until the assault team got eyes on they would not know from the drone feed. They didn’t have to wait to see to find out. The insurgents initiated contact with one man firing a single round at one of the SEALs as he moved to a concealed position across the beach to establish the flanking position. The single round alerted every other sentry. The SEAL’s weapons were suppressed. When another assault team member put two rounds into the insurgent it didn’t make enough noise to be heard back at the compound a couple hundred meters away. Nonetheless everyone in the compound was alerted by the single shot, then the silence. Now they were coming outside the wall. The assault team worked an “L” shaped hasty ambush on the objective, both teams directing controlled fire toward targets they could see. When the volume of returning fire began to increase the SEAL assault team leader radioed for a pair of Viper gunships from an assault ship orbiting off the coast to swing inland for fire support. 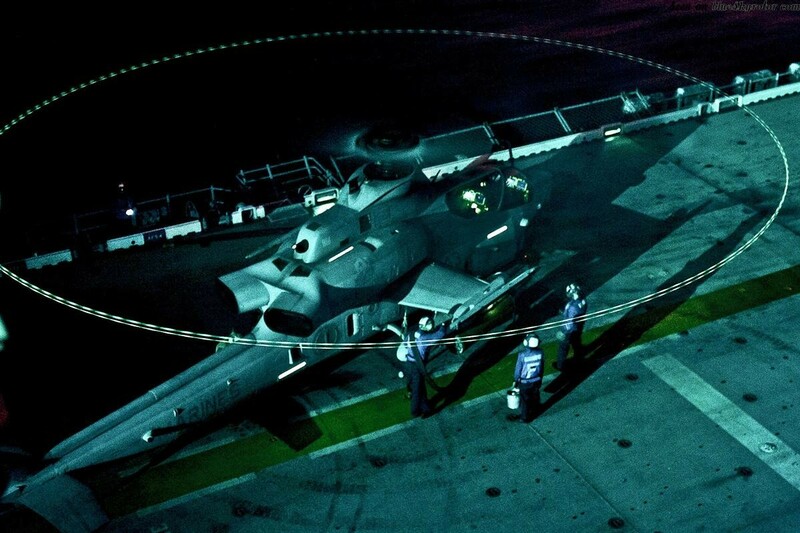 The Viper gunships, an upgraded version of the AH-1 Cobra helicopter, overflew the target from the ocean. They banked hard and attacked facing back out to sea to avoid collateral damage from their guns. When the rounds from the AH-1Z Viper ‘s 20 mm cannon hit the compound the result was like cracking open a hornet’s nest. The pilot and gunner could see personnel and vehicles scatter through their Thales Top Owl helmet imagery system. White streaks showed the path of gunfire reaching into the dark to find the assaulters. Special operations is a fragile craft with a courageous heritage. But the reality is lightly armed men are flung against sometimes heavily fortified targets in inferior numbers. Their primary advantage is speed and violence of action. If their objective is compromised before it can be overwhelmed their chances of success evaporate by the split second. The SEAL assault force commander on the beach knew this well, having operated on both sides of this double-edged sword for a decade. He knew he had men inland a few hundred meters who risked being cut off from the sea extraction route and that securing a landing zone for extraction was, at best, an iffy proposition now. The assault was compromised before it began. He signaled for mission abort and emergency extraction. This contingency was well drilled. The beach fire team put 40 mm grenade fire on the target while the inland team broke contact, peeling back toward the sand and the sea. Each man covered the next in a modified version of the classic peel maneuver to break contact. The Vipers overflew the target at high speed and low altitude, this time flying inland and banking left or south, the opposite direction as before, then paralleling the beach on a gun run to cover the SEALs. Only twenty-five minutes after the first assault element crossed the beach the team was back in the water as their assault boats raced back inland to recover them. After a twenty-minute swim to the east and south the recovery boats spotted the infrared strobes of the assault teams and the recovery was completed. The Vipers left their orbit along the beach just before the SEALs were picked up off shore and the assault force collapsed back out to sea as the sun lit the horizon an angry orange. It would be hours or even days until U.S. assets would know if the target had been compromised in the raid. The raid on Baraawe to capture Ahmed Abdi Godane did not go as planned. It also was not a failure. While the primary objective was not achieved it may have killed or wounded Godane. If not, it sent a clear message to Godane and his men: The U.S. will cross the beach to get you before you can get us. Regardless of the results on the beach that night in Baraawe that message was sent and received loud and clear. 10:58 Local (15:58 UTC), Monday, 7 October 2013, Administrative Offices, Triple Five Group, Mall of the Americas, Bloomington, Minnesota, United States. Davis thought he should be reassured. The thought of installing security checkpoints at the entrance and exit to the mall was unthinkable. It would ruin business and attract the wrong kind of media. This softer approach seemed much less… obtrusive. He hoped it was enough. He noticed his hand shake again. The Arleigh-Burke cruise missile frigate the USS Mahan (DDG-72). Option 1 is the predictable Tomahawk cruise missile strike. 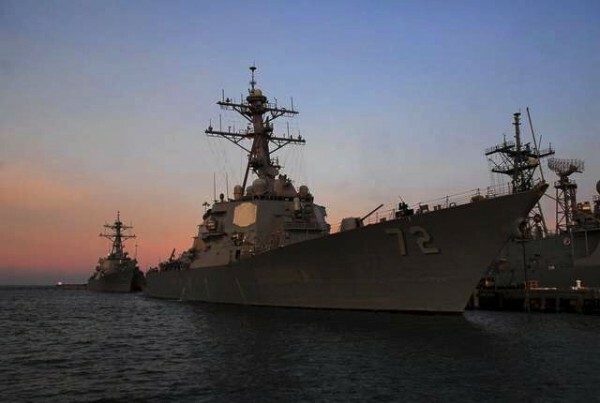 It would likely be launched from the specially equipped USS Stout (DDG-55), the USS Mahan (DDG-72), the USS Ramage (DDG-61), the USS Gravely (DDG-107) and the USS Barry (DDG-933) as they cruise the Mediterranean off the Syrian coast. They would strike the confirmed chemical weapon storage sites with some of their 300+ precision guided UGM-109E Tomahawk Block IV Land Attack Missiles once accurate targeting coordinates (supplied by the Israelis among other assets) are uploaded to the missiles. The destruction will likely be complete and, from a U.S. casualty exposure perspective, antiseptic. Option 2 is a precision air strike carried out by B-2 Spirit bombers launched (possibly) from Whiteman AFB in the U.S. and supported by French aircraft and assets. This is a complex option for a number of logistical and perceptive reasons. It exposes the expensive B-2’s and their crews to a long flight from Missouri. The mission would require multiple mid-air refuelings along with exposure to risk over the target area. The B-2 Spirits of the 509th Bomb Wing may be forward deployed closer to the region, at Diego Garcia for instance, as they were to the Philippines during the recent North Korean crisis. That said, B-2’s launched from Whiteman AFB were recently used for precision strikes against Libya. On March 19, 2011, three B-2s of the 509th Bomb Wing struck 45 targets including the airfield at Ghardabiya, Libya. Bomb damage assessment photos showed hardened aircraft shelters at that base were precisely targeted and destroyed by the B-2’s. The concern with using B-2’s isn’t so much that the Syrians could shoot one down, although their Soviet style integrated air defense network is formidable, it is the complexity of a B-2 raid. A B-2 raid on Syria from Whiteman AFB would likely be over 25 hours in duration. It would cover 12,000+ non-stop flying miles. A benefit of a cruise missile strike compared to B-2’s is, if a Tomahawk missile crashes, no one gets a visit from a chaplain. If a B-2 and its crew are lost that is two terrible messages to deliver and billions in lost technology and training. Option 3 is the wild card. A combined French/U.S. special operations team would use intelligence gathered in the previous months by a number of nations, including Israel. The combined task force would infiltrate Syria from the north via land- likely using trucks. They would assault and capture the chemical weapons storage facility with tactical and rotary wing air support, collecting video of the weapons cache- the “smoking gun”for later distribution to news networks . The world would see the verification. The team would perform a match of the stored chemical weapons against those used in the attacks on the Syrian rebels and civilians. There would be minimal exposure to Syrian casualties, good guys and bad, an intact “smoking gun” of captured chemical weapons and a gold star for an administration already renowned for its creativity. There is no perfect option. Option 1 seems politically antiseptic except for the problem that attacking a chemical weapons cache with cruise missiles risks disbursing the very weapons they are sent to destroy. The US could unwittingly create its own chemical attack. There is also the issue of verification. Tomahawks would make deep, smoking, contaminated craters that could be spun in any number of ways; that there was nothing there, that the strikes spread the weapons even further, that it was, in fact, a pharmaceutical research facility or even that the Tomahawks had carried the gas residue into the target area themselves. Option 2 is so close to option 1 the line between them is blurred. There is the additional exposure of US aircraft being over Syria. Not that there is much concern over Assad’s forces shooting down a B-2, but more that one may have an in- flight emergency and go down anywhere in the region. Messy. Complex. Same problems as Option 1. Then there is option 3. There is a saying that if your favorite tool is a hammer, everything begins to look like a nail. The President has used this hammer before, and hit the nail on the head. The Bin Laden raid was a similar affair. It wasn’t enough to antiseptically dispatch the target with drones or stealth bombers Bill Clinton style. There needed to be a “body”, a “smoking gun”, although hopefully not literally smoking in this instance. Like the Bin Laden raid, there needs to be an airtight case that the chemical weapons seized are the ones used to kill hundreds s of Syrian rebels and civilians. There needs to be irrefutable proof. In a three-hour meeting on Friday evening at the White House, Option 3 won. A ninety-minute phone call between the U.S. President and British Prime Minister David Cameron put the requisite parties in touch, and the required wheels turning. Parliament voted the British out, the French were still in. Planning for Option 3 began at Headquarters; United States Special Operations Command, MacDill Air Force Base near Tampa, Florida. Directives were issued. The units involved were sent into isolation for planning. The U.S. Army and the Navy had maintained a WMD special operations response capability since 9/11. They had deployed operationally several times, mostly in Iraq for WMD recovery. Their commanders brainstormed ideas using existing mission templates for this contingency. It only took an hour to flush out a viable plan by comparing templates to intel. Thirty hours later the assets were in motion. A key part of the plan was to strike while the news cycle still carried the photos of dead Syrian children on their front pages. In the Internet age the public has a short memory for horror. The U.S. special operations team inserted into Turkey under various covers as journalists, aid workers and weapons inspectors before launching their raid into Syria. The U.S. special operations component of the mission would remain entirely classified, as it usually did except in the case of Operation Neptune Spear, which made for darn good Hollywood and bookstore fodder. No one would ever know the details of U.S. ground involvement in this operation, now internally dubbed “Operation Specific Scalpel”. As far as the media was concerned this was a joint operation between a hastily assembled coalition, the Syrian rebels and with “assistance and support” from the U.S. and France. Israeli intelligence said the missiles used in the mass attack came from the Adra Industrial City complex to the Northeast of Damascus. In an attempt to maintain maximum unattributability Assad’s special chemical strike units had used an indigenously developed short-range attack missile. The Israelis estimated its maximum range to be no more than 30 kilometers. The mysterious missiles that delivered the chemical weapons were nearly impossible to identify suggesting local production adding to their unattributable nature. The plan was simple. The U.S. and French Counter WMD Special Operations team would covertly infiltrate Syria using trucks from Turkey. They would drive south toward the target in Adra where they would dismount and begin the assault. The objective was not to destroy the chemical weapon storage facility in Adra but to capture it intact and turn it over to a joint Free Syrian security team who would then grant access to chief chemical weapons inspector Ake Sellstrom’s team via UN disarmament chief Angela Kane. “Special Operations” are called that because there is always a creative element to them. They don’t fit molds or mission templates exactly. This operation had a lot of sharp edges. Any op involving chemical weapons had an ominous aspect to it. The assault team decided it would not use protective chemical suits. The suits would not facilitate the need to appear as indigenous personnel. The intelligence suggested they were attacking a storage facility, and that the chemical weapons would be “safed” or not assembled in their delivery state yet since it was dangerous even to store them in that state. The trucks would deploy the assault team around the perimeter of the storage compound. The assault would open with precision shooters neutralizing guards, vehicles and even attempting to breech locks with their .50 caliber sniper rifles. Under the cover of the sniper/spotters, four assault teams would approach the facility, one from each side. To prevent a “Mexican firing squad” of deadly crossfire only one assault element would push through the target, from the high ground to the north, breeching the fence line with bolt cutters and breeching charges and then fanning out into the rows of storage buildings while the surrounding snipers provided what overwatch they could. Once the facility was seized the supporting international units would insert via helicopter. Included in their charges would be weapons investigators to verify the presence of the weapons and “fingerprint” the chemicals. They would also take possession of the unique delivery rockets from the U.S. commandos who seized the target. As news of the seizure by the United Nations forces hit the BBC, CNN, Al Jazeera and MSNBC the U.S. team would already be extracting back to Lebanon and back to the ships they deployed from. 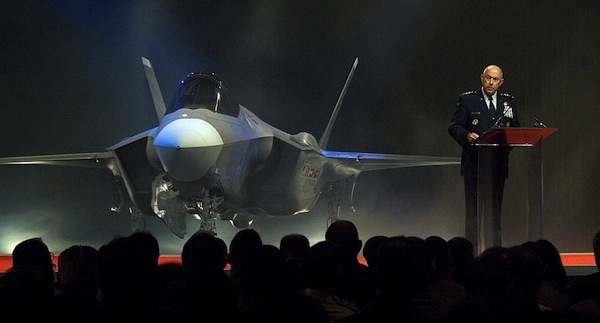 The F-35 was unveiled to the media like a new car model or an up and coming pop star. And subjected to similar public vitriol. You’ve seen posts on Facebook about the new F-35 Lightening II Joint Strike Fighter contending it’s a “failure”, “a waste”, “damaging to the environment” and even that “F-35 Basing is a Racial Injustice: New Americans and people of color are disproportionately harmed.” The public vitriol surrounding the F-35 program eclipses any previous defense program. A. A costly boondoggle spun as a super plane by the Pentagon “old boy network”? B. The next ultra-weapons system that will render nation-users invincible? C. A combat aircraft at the beginning of a typically difficult development program? Another reality is the F-35 is the first major weapons system to do combat on the battlefield of social media. Social media is a great equalizer among combatants. All you need is a laptop and “friends” to fight a battle with the biggest defense contractors on earth. Whether you are Lockheed or Larry Smith the anti-F-35 activist, every opinion on social media is 800 x 600. 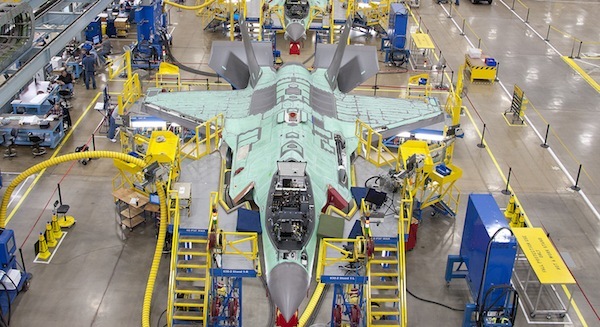 The F-35 in its low-rate initial production phase at Lockheed-Martin’s Fort Worth, Texas assembly facility. If you add some historical context to the development of military aircraft you see daunting realities. Firstly, the F-35 is actually doing quite well for such an ambitious project. In fact, some of the criticism for what has been described as “delays” may actually be the F-35 program’s primary drawback: too much caution. 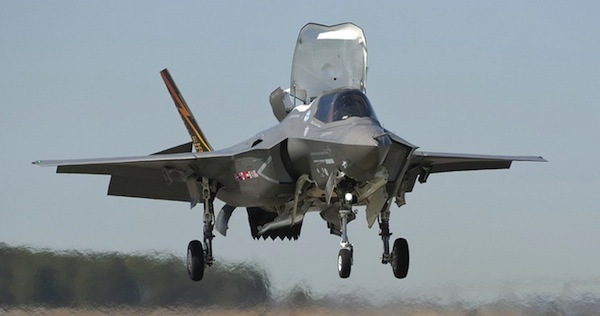 Partially because the magnifying glass of public opinion has focused so much heat on the F-35 the program has ground slowly ahead with more than the typical degree of caution. Let’s look at some previous military aircraft development programs and think about how they would fare under “trial by Facebook”. An early model B-17 Flying Fortress breaks up over Germany in WWII. More airmen died in the first versions of the celebrated bomber than any combat aircraft in WWII. In WWII my father was a draftsmen for Boeing Aircraft in Seattle, Washington at “Plant 2” near the Duwamish River. His first project was drawing a quickly conceived update to the B-17 Flying Fortress: a chin turret with two forward facing .50 caliber guns. The first eight versions of the B-17 lacked adequate guns to defend themselves from a frontal attack. 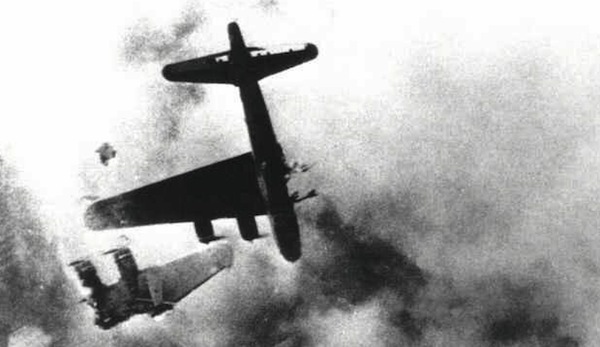 German pilots quickly learned to attack the B-17 from high and head-on, or “Twelve O’clock High”. The results were catastrophic. Early B-17 crews attacking Germany had better odds of dying than surviving before completing their required 25 missions. In fact, more aircrews from the Allied 8th Air Force died over Europe than all of the Marines killed in the Pacific in WWII. Today the B-17 is remembered as a “great aircraft”. How would Facebook pundits have treated the first eight versions of the B-17 with a record like that? 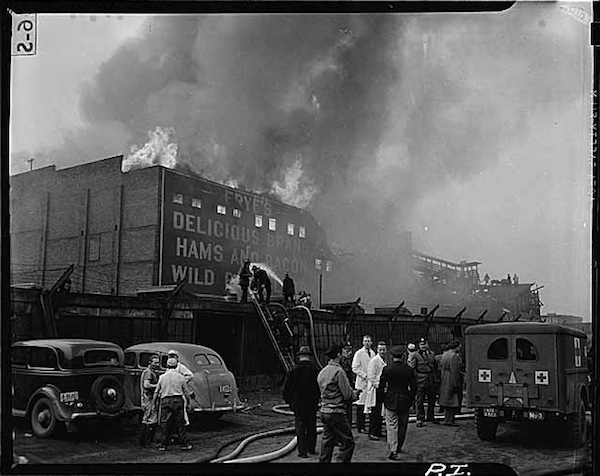 A B-29 Superfortress crashed into a meat packing plant in Seattle during its secret testing phase. The program was so classified that firefighters and first responders were initially prohibited from entering the crash scene. My dad was transferred to a top secret project working on a super bomber that would fly too high to shoot down and carry a larger bomb load than the B-17. It was the B-29 Superfortress, a project so secret he wasn’t allowed to tell my mom what he was working on. The B-29 delivered the only nuclear weapons used in combat. It is largely credited with ending the war in the Pacific. But the B-29 was a difficult and dangerous aircraft to operate. It used four Wright R-3350 engines that were prone to overheating, and catching fire. With a full bomb load while straining to get to altitude it was common for the B-29 to have engine fires. The B-29 killed a lot of U.S. flight crews. The engine problem, combined with navigation and bombing accuracy problems encountered from an undiscovered high altitude wind phenomenon called the “jet stream” forced Maj. General Curtis LeMay to order B-29’s to attack Japan from low altitude, well within range of Japanese anti-aircraft guns. To carry more bombs LeMay told his bomber crews to remove their defensive guns and leave their gunners behind, a request some crews ignored according to the definitive account of B-29 operations, Mission to Tokyo by author Robert F. Dorr. What would people have said about the B-29 program on Facebook? The General Dynamics F-111 was originally intended as a multi-role, do everything aircraft for both the Navy and the Air Force. The Navy dropped it in early development, opting for the Grumman F-14 Tomcat. It ended its largely undistinguished career in service with the Australian Air Force. More recently, and in an oddly similar program to the F-35 Joint Strike Fighter, in 1961 former Defense Secretary Robert MacNamara asked for a feasibility study on the development of one aircraft that could perform low-level, supersonic penetration bombing missions into the former Soviet Union and also serve as a fleet defense interceptor launching from aircraft carriers for the U.S. Navy. The result was the General Dynamics F-111. 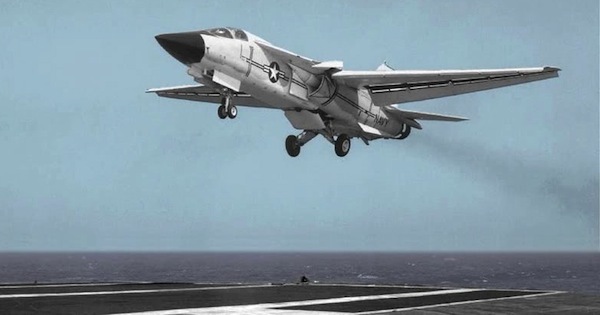 The F-111 was never adopted by the navy and served with mixed results in the Air Force. Initial F-111 operations in Vietnam were a catastrophe, with 50% of the aircraft being lost and the Vietnam deployment being halted. The one shining moment for the F-111 came during Operation El Dorado Canyon under the Reagan administration, when F-111’s attacked Libyan airfields in retaliation for Libyan sponsored terrorist attacks on U.S. servicemen. A version of the F-111 never initially envisioned, the EF-111 Raven electronic warfare aircraft, did serve successfully in the early Gulf war but, in general, the entire F-111 program fell well short of its original multi-role, multi-service concept. These are three examples of aircraft that had major problems eclipsing anything the F-35 faces. But that was a long time ago. We’re not in a major air war with a similarly equipped air force. Technology has come a long way. Engineering tools exist today that were unheard of even in the 1970’s when the current generation of operational combat aircraft were first conceived. And those are some of the reasons the F-35 has been treated unfairly. 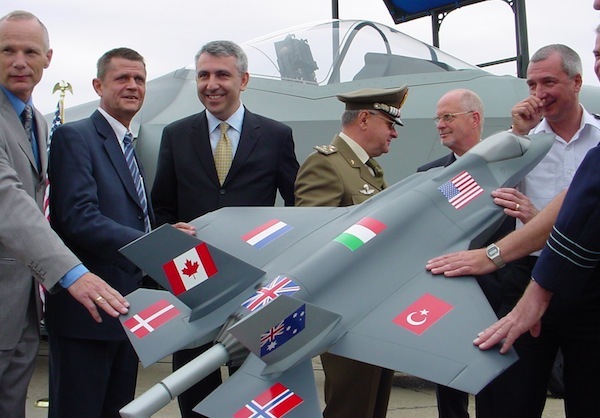 The development and production costs of the F-35 are to be shared between a host of nation-users, but the Eurozone crisis and global recession has placed more economic pressure on the program. When cost estimates for the F-35 were originally drafted much of the development program included the new generation of virtual prototyping and testing. Computational Fluid Dynamics replaced early prototype flight-testing. Finite Elemental Analysis replaced actual strain gauge developmental analysis. The business model for the F-35 included development in the virtual space spread over international economies of many user-nations. Each of these factors left opportunities for a host of variables to act on the program and drive costs up. Some of those variables, such as the European economic crisis, have become a reality. Another reality is the need for all combat aircraft to evolve significantly over their life span. The F-16, FA-18, AH-1 Cobra and AH-64 Apache are just a few legacy aircraft flying today that have undergone such sweeping updates they only vaguely resemble their original versions. The F-16 now has conformal fuel pallets, different control surfaces and improved sensors installed. One version of the FA-18 has gotten larger wings, new intakes, improved avionics and become an entirely new aircraft called the EF-18 Growler. And then there is the B-52 bomber, the plane that just won’t die. The B-52’s in operation now are older than their flight crews. They were based on lessons Boeing learned from- you guessed it- the B-17 and B-29 development programs my dad worked on in WWII. And the B-52 is still flying. People post photos of them on Facebook now, talking about how amazing an aircraft it is. Social media wasn’t around for the bumpy development years. U.S. Marine Corps test pilot Lt. Col. Russ Clift performed the first F-35B night-time vertical landing aboard the USS Wasp off the Maryland coast last Tuesday, August 13, 2013. The F-35B replaces the aging AV-8B Harrier for the U.S. Marines and the Royal Navy. The F-35 wasn’t developed in the middle of a world war, but it is being fielded in one of the most volatile periods in history, when enemies use airliners as attack aircraft and superpowers are fielding a new generation of combat aircraft like the Russian T-50 and the Chinese J-20. While it’s unlikely Al Qaeda, Islamic Jihad and their radical splinter organizations will field a new- or any- combat aircraft the ability to command the airspace over insurgent controlled territory has kept their doctrine in the Stone Age. It has also helped prevent another 9/11. The F-35 won’t bring peace to the world. It isn’t the final answer- no single combat aircraft is. It’s likely not even the best combat aircraft ever. But it is a viable next generation multi-role combat aircraft with a degree of information sharing and mission flexibility that can’t be retrofitted to aging current aircraft systems. It is also designed to fight a war we don’t know everything about yet: the next one. And while uncertainty, at a minimum, swirls around the F-35 on the vaunted spaces of social media the one thing that is certain is, that next war will come. In an official Lockheed-Martin photo, the V-STOL variant of the Lightening II, the F-35B, performs an early vertical landing. Test pilots report that vertical take-off and landing in the F-35B is “extremely easy” compared to the previous AV-8B Harrier it replaces. By Tom Demerly for MILTECHREV.com. NSW Publications has released a comprehensive new reference book on all aspects of United States Navy Special Operations titled United States Naval Special Warfare by Greg F. Mathieson Sr. and David Gatley. The book is a large wardroom-table size 13.5 X 10 inch (35.5 cm X 25.5 cm) and is 403 pages long, weighing a hulking 8 pounds. It contains hundreds of new, never published, photos in addition to the original text. 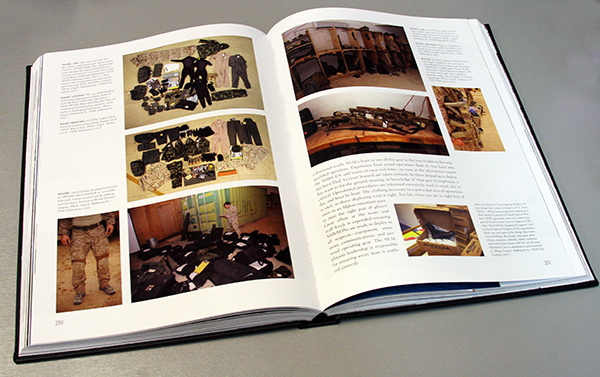 Both an entertaining visual experience and a valuable reference, “Naval Special Warfare” contains accurate insights into SEAL and SWCC equipment from the past, current and even into the future. The Navy SEAL book category is a crowded one with Amazon.com returning 4,389 results for a search on the book topic “Navy SEALs”. What sets United States Naval Special Warfare apart is its freshness, accuracy and scope. Previous large format photo books on Naval Special Warfare have contained generic, public release official U.S. Navy photos usually seen in numerous publications. United States Naval Special Warfare uses photography we’ve never seen in previous books or publications. Even the photos of historical, older SEAL training and operations in United States Naval Special Warfare are original. Authors Greg E. Mathieson Sr., (left) and David Gatley (R). Co-Author/Photographer Greg E. Mathieson Sr. served over a decade in the U.S. Army prior to becoming an expert in defense photography. He is the founder of MAI Photo News Agency, a journalistic resource that specializes in military and tactical photojournalism. Mathieson has published photos in every major, mainstream news publication. His relationship with each branch of the military and his experience as a member of the U.S. Army provide him with a degree of technical insight that, arguably, no other photojournalist currently enjoys. Mathieson’s photos bring this book to life as an engaging and fascinating insight that serves as a strong visual reference. Co-author David Gatley owns three Pulitzer Prize nominations and has 35 years experience as a professional photographer. He is also a former RAND Corporation analyst for military weapons systems. Gatley owns six tours in the Middle East with deployed combat units. He has also done commercial photography for General Dynamics, Lockheed, ITT Defense and has provided imagery of sensitive material to his clients. A big part of the appeal of United States Naval Special Warfare is the scope of the subject matter. Topics given short-shift in previous books are examined in detail in Mathieson and Gatley’s book. 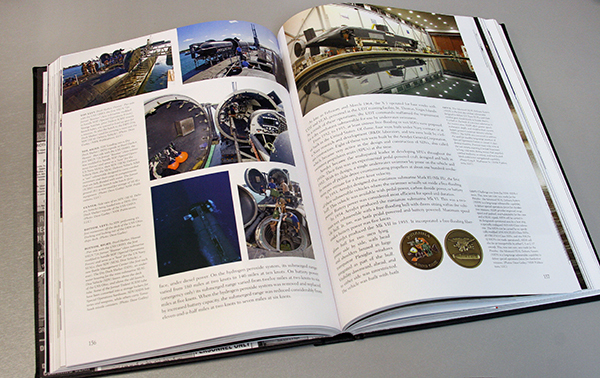 Of special note are new photos and detailed insights into submersible operations and SEAL delivery vehicles past and present. We’ve never seen this level of detail and insight into the (previously) secret SEAL Delivery Vehicles. 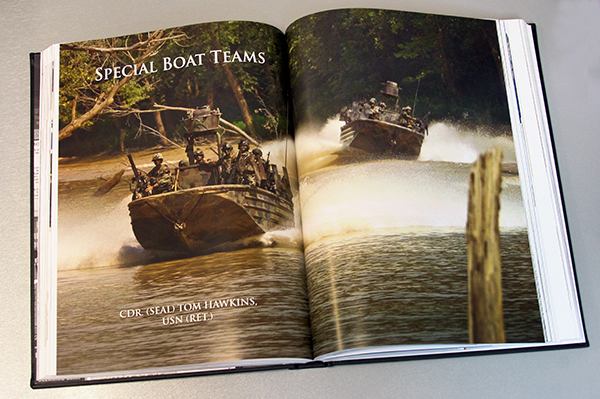 The book also devotes considerable photography and insights into the Special Warfare Combatant-Craft Crewman (SWCC) branch of Naval Special warfare with new insights into their littoral boat technology, operations and the training and history of their crews. While much has been written about the SEAL teams themselves, there is very little available reference material on the Special Warfare Combatant-Craft Crewman units. Mathieson and Gatley’s photography is fresh and original, even in depictions of Naval Special Warfare team operations from a number of years ago. 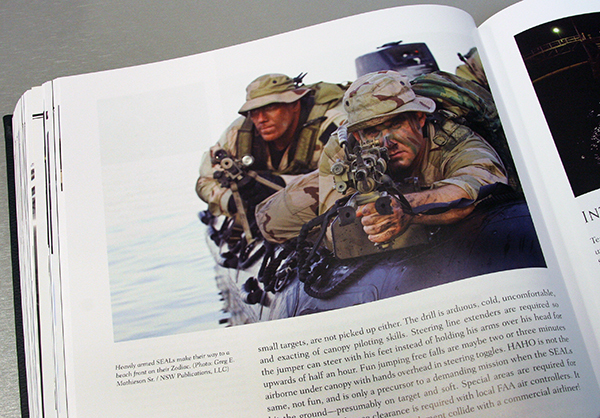 Most gallery style military books are primarily photo references but Naval Special Warfare backs up the great, original photography with accurate, detailed and in some cases, previously unavailable insights into Naval Special Warfare. Additionally, the text is well written and engaging. Nailing both the photography and the writing in a book that reports on a secretive society is a high bar to clear, and Naval Special Warfare sets the new standard for books on this subject. 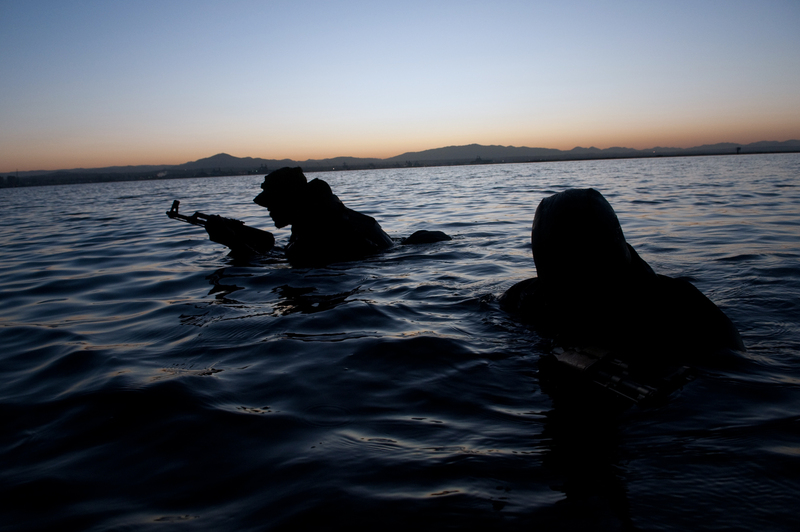 Significant attention is given to the special operations “brown water” navy, the Special Warfare Combatant-Craft Crewmen units in “Naval Special Warfare”. Finally, if you enjoy well made and archival, library quality paper books the construction of Naval Special Warfare is impressive. The giant book uses a real “case binding” with beautiful quality case cloth on the board outer of the binding with nicely done shoulders on the signatures of the book binding. This is a historical grade binding and printing that can serve as an empirical research resource in libraries. The cover on our review copy had no paper slip cover, likely because of the elaborate, deeply embossed Naval Special Warfare Insignia. 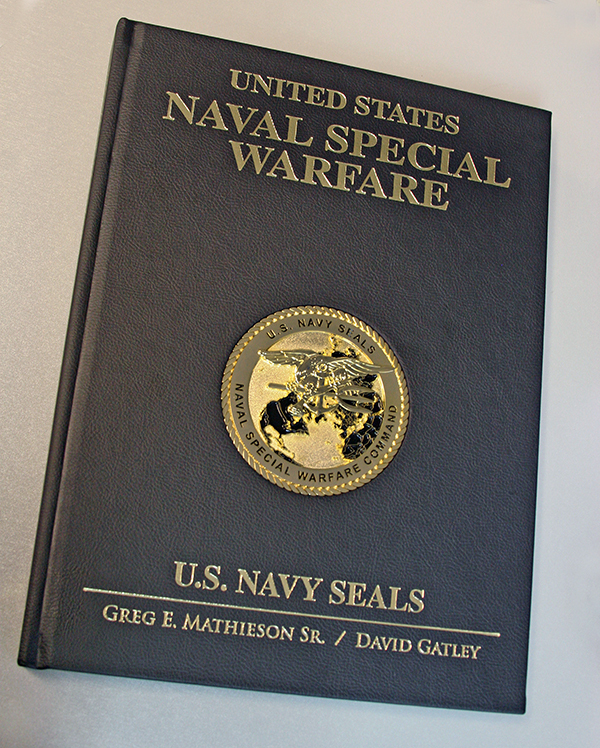 The cover of the book features a deeply and intricately embossed insignia of the Naval Special Warfare Command and the SEAL qualification badge, the Trident. It looks like something you’d see on a flag pole outside the Phil H. Bucklew Naval Special Warfare Center in Coronado, California. The book is built with a library quality “case binding” with heavy cloth board cover. 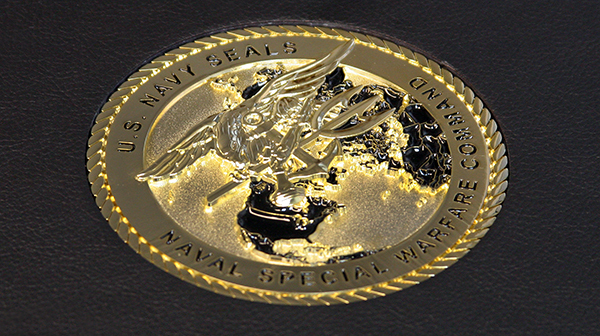 Every aspect of Naval Special Warfare is covered in detail and with currency and authority in Naval Special Warfare. This book is the start point for any literary survey of Naval Special Operations and will be an important title in any collection of books on Naval Special Warfare. 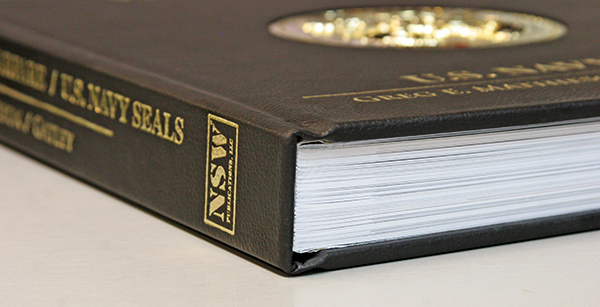 The book is currently sold directly from NSW Publications LLC for a “Printers Promotional Price” of $65.00 with an advertised “List Price” of $98.00. The Multicam Man: Caleb Crye, innovator of Multicam and Crye Precision products made an appearance in his booth and shared a smile. The Crye Precision booth hosted the darling Hot Shots calendar girls making it a popular stop. People make our industry and the 2012 SHOT show was a great opportunity to meet the faces behind the products in the defense industry. One of the many benefits of attending the SHOT show is the opportunity to speak to the people behind the products. The 2012 SHOT was an all-star cast of product innovators in defense and tactical innovation. 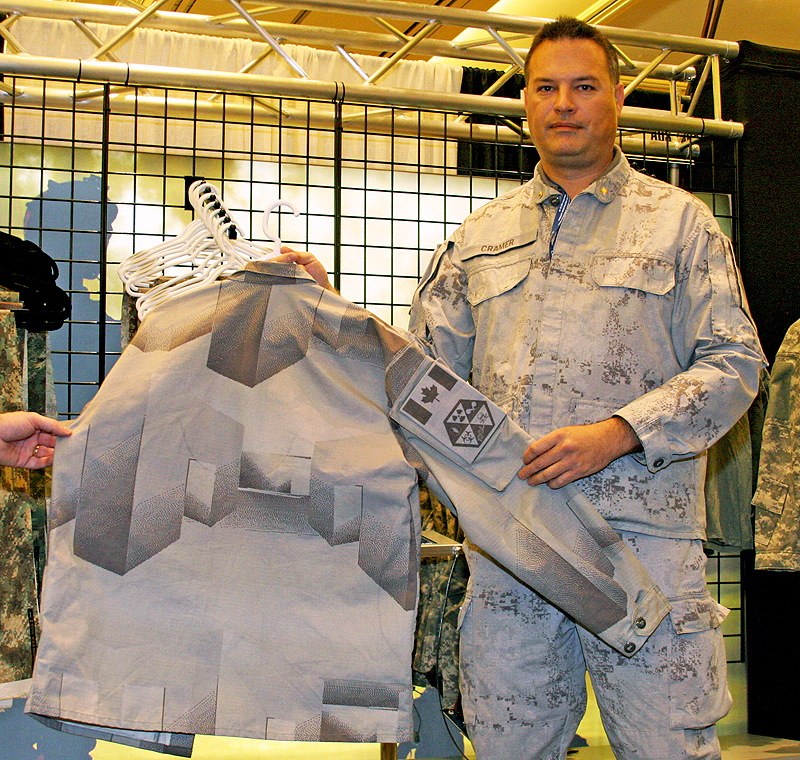 One of the most impressive, and unassuming figures at the the 2012 SHOT Show was Multicam innovator Caleb Crye. 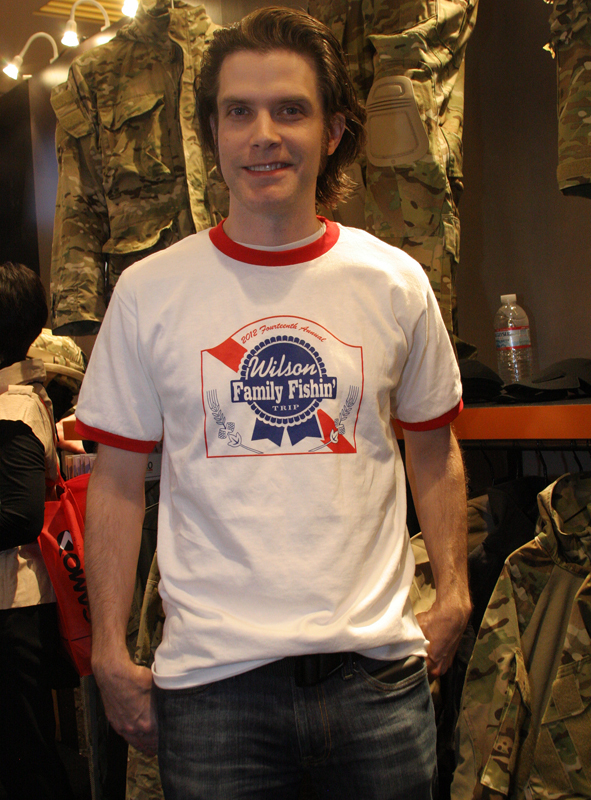 In contrast to many of the defense industry personalities at SHOT with their close cropped military haircuts and tactical clothing Caleb Crye sported a stylish flop, jeans and a family reunion T-shirt styled after Pabst Blue Ribbon beer. You would hardly guess he is one of the most influential military equipment designers in the world. Crye’s uniforms and equipment have vaulted the soldier’s gear forward. In many cases his advances have come so fast the military has had difficulty keeping up. The slow moving government acquisition process has been a thorn in his side. Crye Precision cleared a major hurdle after the U.S. military community realized the Army ACU pattern was ineffective in arid environments and authorized Multicam as a camouflage uniform. The change provided Crye Precision with a healthy bump in government contracts to its already massive bottom line. Quiet, shy and unassuming, Caleb Crye is like many great innovators. It was a pleasure to meet him in person, and a little tricky to get him to smile for our cameras. Another man responsible for innovative camouflage schemes is Guy Cramer of Hyperstealth. Cramer uses mathmatical equations and detailed insights into how the eye and the brain perceive objects visually to develop his unusual camouflage schemes. Some of them are truly bizarre. He showed us an “urban” camouflage scheme that seemed to have buildings printed on it, an outwardly odd idea that Cramer claimed was “highly effective in maintaining visual stealth and tricking the eye in the urban tactical environment”. Guy Cramer's innovative camouflage designs include this unusual urban concept that he claimed made it difficult to visually acquire a soldier in an urban setting. Cramer’s designs rely on, among other features, patterns within patterns or “fractal patterns”. Fractal patterns trick the brain into categorizing visual images as something other than they are. His designs are effective. One of them is a finalist in the Army’s current selection process for the new soldiers’ uniform being conducted by the Army Natick Soldier Research Development and Engineering Center (NSRDEC). Cramer's visual stealth schemes include the interesting digital pattern on their rep (left) and samples of the proposed new U.S. Army combat uniform scheme on the hangers in the background. Between interviews at SHOT show we got a chance to meet members of some of the most interesting and elite military and law enforcement units. Some could discuss their units and be photographed, others could not due to security concerns. Among two we ran into who were willing to appear on MILTECHREV.com were a pair of Special Operators from NASA’s elite Special Weapons and Tactics (SWAT) Team. Founded in 1979 the team is tasked with high level security operations around our nation’s space centers such as the John F. Kenedy Space Center and other facilities. Among the many interesting units we met at 2012 SHOT were these officers from the Royal Dutch Army (left) and a pair of operators from NASA's elite SWAT team that secures our nation's space operations. Another brilliant innovator we had the pleasure of meeting in person is Beej Cronin, Mastermind Designer along with his associate Chris Cronin, Director of Sales for Kitanica. If there are two greatly under rated tactical innovators in apparel design Kitanica is one of them, the other we’ll mention in a moment. Beej Cronin showed us a number of new designs from Kitanica including their new Winter Softshell, 2 Zip Fleece and Mark V jacket. We’ve been wearing Kitanica’s impressive PNT GEN2 tactical pants and they are the finest full-feature tactical pants available. Their new fleece tops follow that trend in technology and features and are a strong value at reasonable prices. The new Winter Softshell uses 4 chest pockets and a unique flow-through ventilation system on the chest ideal for managing heat while carrying a pack. There are also hand warmer pockets, a rear lumbar pocket, three shoulder pockets and a waist and bottom hem drawstring. The jacket is Polartec PowerSheild laminated fleece with a windproof, water resistant layer laminated into the fabric. The unique 2-Zip Fleece uses a raglan-pattern zipper system that enables the top to be donned over the head while wearing a helmet. This is a boon for layering while inside an aircraft or small vehicle. This also looked like something we’d want to wear under a dry suit for a diving operation. The top is heavy, made of Polartec 300 Thermalpro. It would be an excellent piece for cold maritime environments and layering under a shell jacket in arctic conditions. Beej Cronin, Mastermind Designer of Kitanica shows us their new 2-Zip Fleece (left) of heavy Polartec 300 Thermalpro and the impressive Kitanica Winter Softshell jacket in windproof and water repellant Polartec Powersheild. 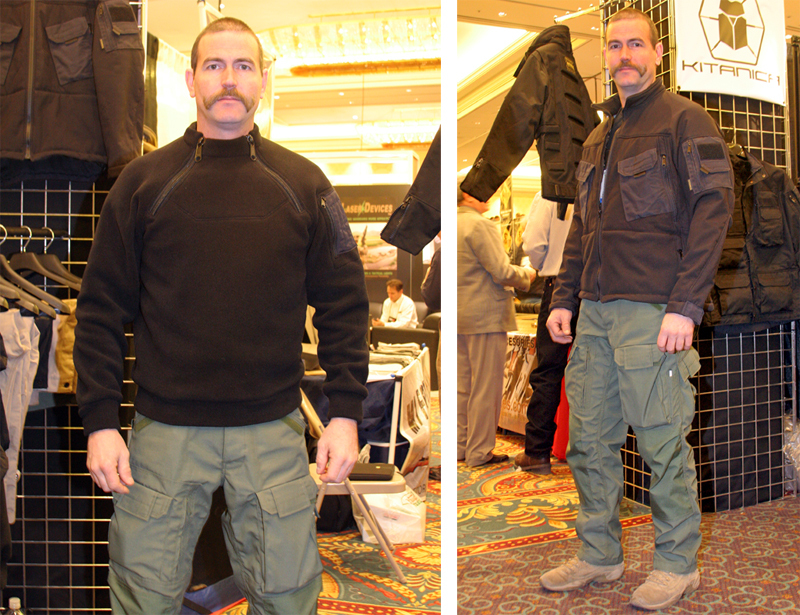 The second tactical apparel innovator we were so impressed by is Vertx. Vertx discreet tactical operator pants are the very best low profile tactical pants we’ve used. The fit, fabric, pattern, pockets and overall features are superb. It’s the tactical pant you can wear without looking… too tactical. 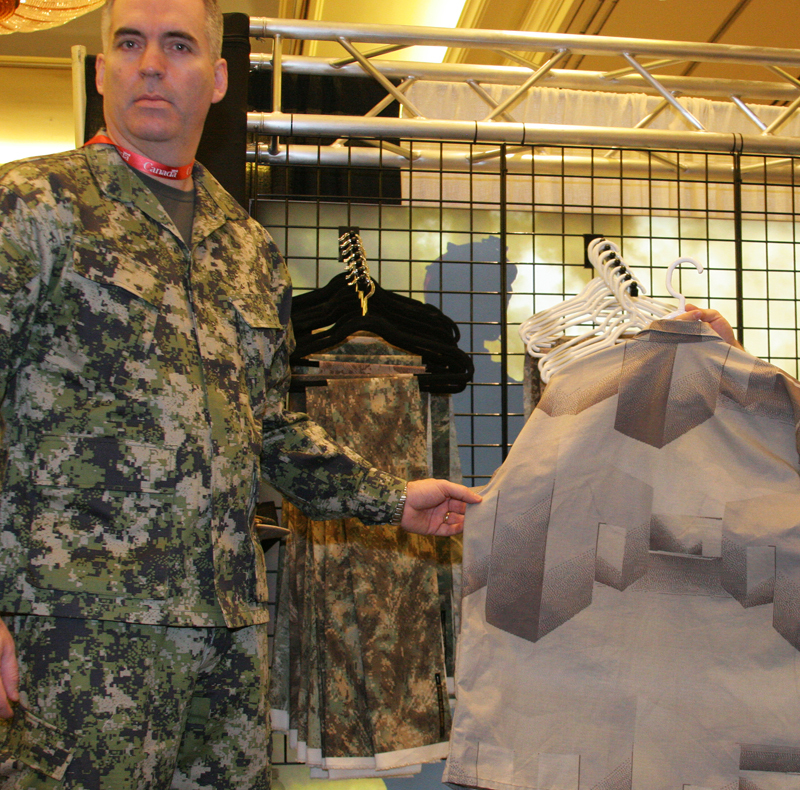 The gem in Vertx’s booth was their new Vertx Multicam Smock. This new version of the classic parachutist’s smock uses new patterning, fabrics and design details to reinvent the tactical smock category. This completely replaces the conventional field jacket, merging an active insulation layer with a shell garment that spans a wide range of temperatures and climates. The Vertx Multicam Smock packs so much technology and design innovation into one garment we are devoting an article to its review (coming soon). 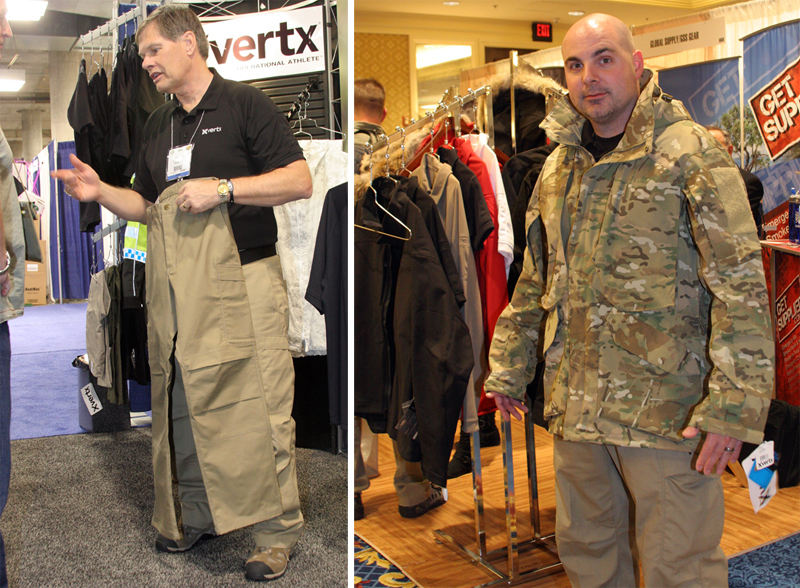 Vertx showed us their discreet tactical pants (left) and their new softshell tactical smock, a great update on this design theme that redefines the category. We have one final update in our SHOT show 2012 Series here on MILTECHREV.com. SHOT Show 2012: Lighting and Accessories. 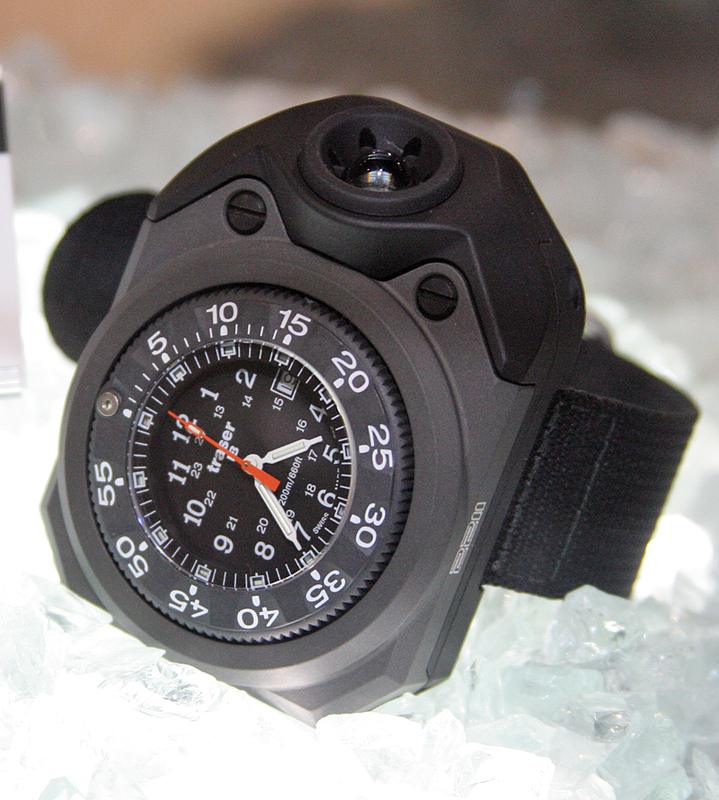 Surefire showed their new Wristlight combined watch and flashlight, an innovative direction in tactical lighting. Accessory categories including tactical lighting were significant at SHOT Show 2012 with an incredible number of new and innovative products and even a few new product categories. Surefire’s booth was crowded with show attendees looking at their new G2X Polymer tactical lights. The G2X is an economical, sub $100 personal light with a durable LED for a lamp and Nitrolon polymer body. The new G2X family uses the traditional Surefire switch, press a button for momentary light, turn the end cap righty-tighty for constant on. The body of the light feels great in your hand with an anti-slip, matt finish and a series of recessed areas so you can hold the light between an index finger and middle finger while you depress the momentary “on” switch with your palm. The light is sold in tan, black, yellow and forest green and uses two CR123A batteries for 200 lumens lasting an advertised 2 hours burn time. Surefire has a series of accessories to support the light line including a button press tailcap switch and a series of filters you can slide on the front of the light to change the light color. At $95 MSRP the G2X is a great update for Surefire’s polymer tactical lights. Surefire's new G2X Nitrolon LED tactical light brings high performance lighting to the sub-$100 price point for 2012. When the new Surefire Nitrolon G2X attracted people to the Surefire booth the Wristlight wrist mounted flashlight and combined Wristlight/Traser tritium luminous display watch kept them there. While Surefire was tight-lipped about an introduction of the combined watch/light unit the stand-alone wrist light has had an extensive development and is slated for consumer release. The thing is bright, 200 lumens, the same as the G2X Nitrolon flashlight. No word on battery life or release date, but a new “must have”. 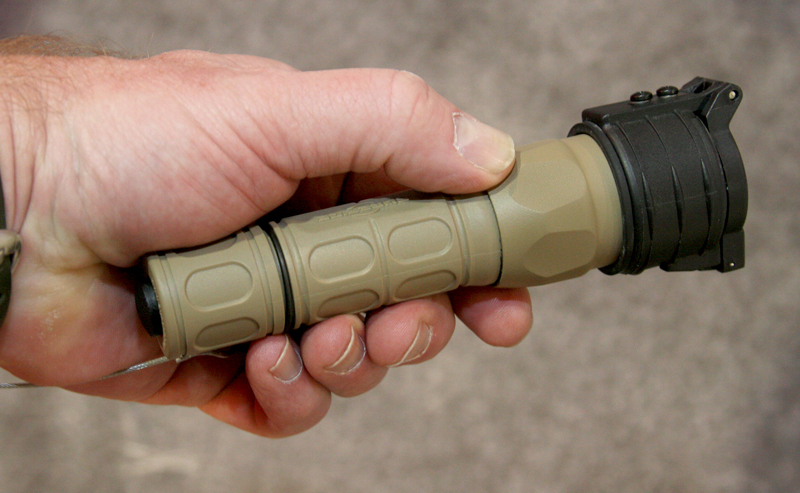 Surefire's new Wristlight is 200 lumens of bright light where you need it. The combined Traser watch/Wristlight may... or may not live to see the consumer market. We'd buy it! SOG Specialty Knives and Tools let us try the new DarkEnergy 214 and 247 tactical flashlights. 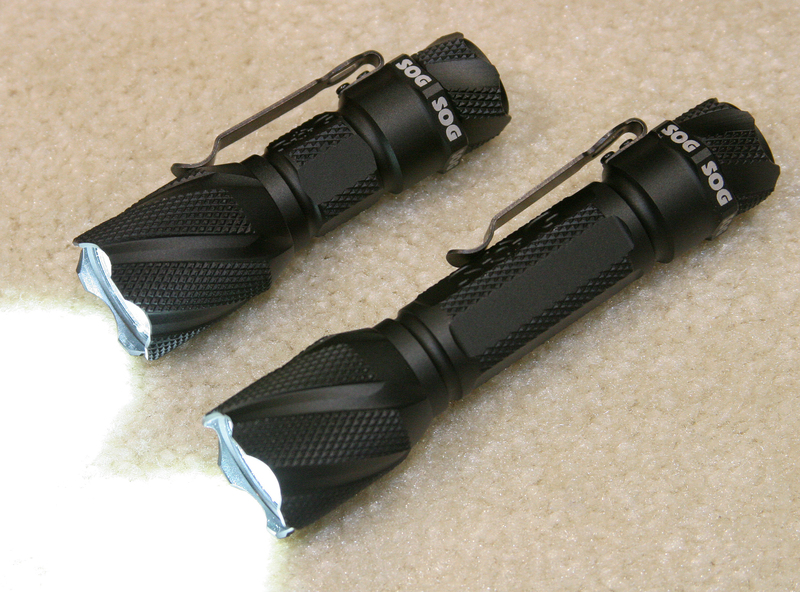 These two flashlights from SOG, known for their knives and multi tools, are intended to maximize the light output in the smallest possible flashlight size. Their diminutive DarkEnergy 214, a 3.8 inch light, blasts out a claimed 214 lumens from only one CR123A battery. There are two beam strengths with a maximum claimed run time of 3 hours on the lower light setting. The flashlight bodies are 6061 T-6 aluminum and the switch is a full click on/off switch with a flashing mode and a “half on” 40% light output mode. MSRP on the smaller DarkEnergy 214 model is $105 and should be in retailers by Spring of 2012. A larger, brighter DarkEnergy 247 blows out 247 lumens max (hence the name) for only $25 more at $130 MSRP. The brighter light is larger since it uses two CR123A batteries in its 5.1 ” long body. Run time is longer too with a maximum claimed 8 hours run time on low setting. We turned the light on and off and the switch felt great. Fit and finish on the pre-production samples we saw was very nice. These imported lights are strong performers at good price points. SOG Specialty Knives and Tools showed their new DarkEnergy 214 and 247 lights with super high output, 6061T6 aluminum alloy body and multi-function on/off switch. Streamlight had a wide variety of innovative lighting products including their versatile Sidewinder Compact II. Streamlight sells the Sidewinder Compact II as “20 Flashlights in One” since it has multiple modes, four different models (Military, Aviation, Medical and Sportsman) and can be used on a helmet mount, as a headlight with strap, will clip to MOLLE webbing and work as a stand alone flashlight. The Sidewinder Compact II has incredible battery life and operating temperature range from its CR123A 3 Volt Lithium battery. The versatility of the Streamlight Sidewinder Compact II combined with its reasonable price below $70 US make it a strong value. Streamlight's Sidewinder Compact tactical multi purpose light packs a lot of lighting versatility into a compact, value oriented system. Princeton Tec showed a growing line of tactical lighting gear including their proven Remix Pro and Fred Tactical MPLS in tan, ACU/OD, Tan/Multicam and black. With over 70 hours of burn time on the high beam and 35 lumens from 3 AAA batteries the Fred Tactical MPLS adapts to helmet NVG mounts, MOLLE and uses a headstrap. MSRP is less than $50. Princeton Tec also showed a growing range of helmet mount “Switch” personal task lights using their versatile “flexi-neck” design. These little lights have a few unique features including the little flexible stalk the LED light is mounted to. The stalk enables the user to direct the light where they need it and keep it there hands free. The Switch uses a miniature 2016 litium battery and gives off a tactically appropriate 10 lumens of light in a few different colors. A new version from Princeton Tec uses a larger battery case and three LED’s for more run time and better illumination. 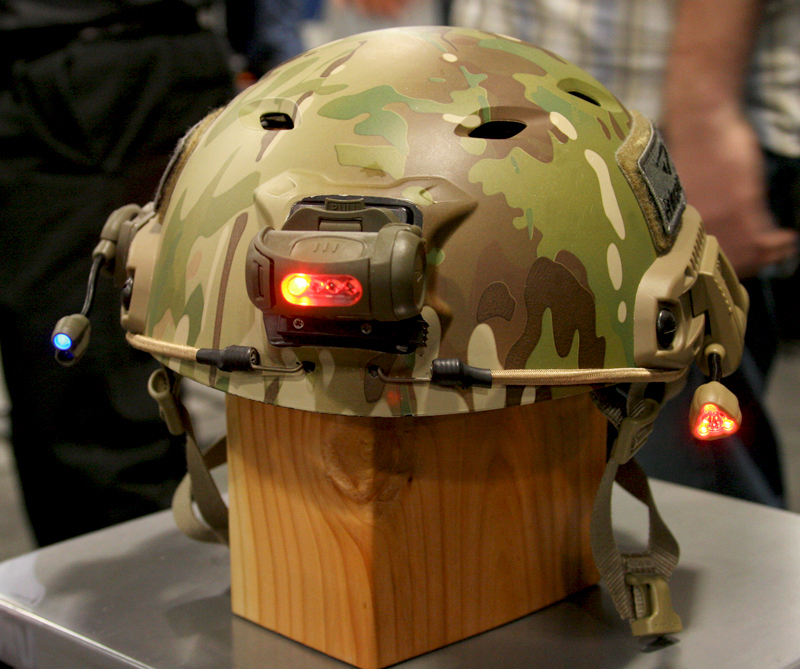 Three of Princeton Tec's lights include the new triple LED unit on the right of the helmet above. A truly impressive brand we found at SHOT Show is Alpha-TAC ExtremeBeam. ExtremeBeam lights featured aluminum cases, high output that ExtremeBeam claims exceeds “performance of some 600 lumen lights” excellent feeling controls and incredible prices, many below $60 US MSRP. We spent considerable time in the ExtremeBeam display booth trying different models and became more impressed with each light as we used the switches, disassembled the lights and then, most pleasantly, learned about their excellent pricing. ExtremeBeam showed a wide variety of nice quality, value priced lights with double sealed alloy bodies, shatter resistant lenses and nice feeling switches. The folks manning the booth at ExtremeBeam knew their flashlights and pointed out that the color frequency of their lights optimized contrast and visibility in moist/humid weather conditions. The design of the flashlight body also accommodates several battery configurations adding versatility. ExtremeBeam told us the run time on the SX21 model was “about 7 hours” on one set of CR123 lithium batteries. 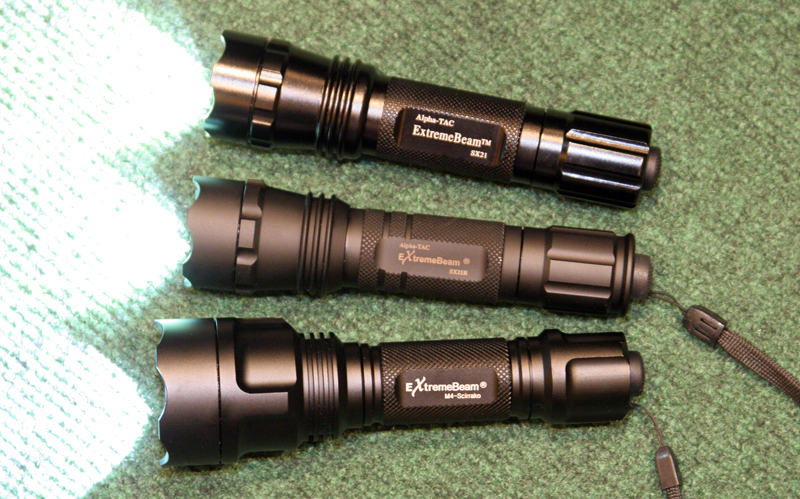 ExtremeBeam's SX21R was bright, light weight and inexpensive with an MSRP of less than $80 USD. Our SHOT Show 2012 coverage continues this week with more new products and people from the tactical/defense industry on MILTECHREV.com. 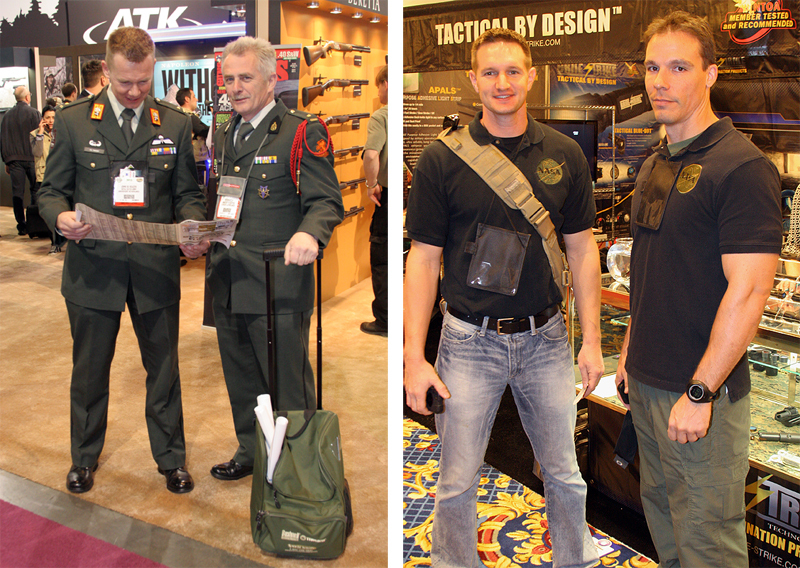 The evolution in tactical footwear was never more evident than at SHOT 2012. Danner’s impressive booth featured this beautiful U.S. made, Berry compliant boot for 2012 called the Rivot TFX. In our first round of SHOT Show 2012 coverage for MILTECHREV.com we look at new footwear innovations and some proven styles shown at the SHOT show in Las Vegas, Nevada from January 17-20th, 2012 at the Sands Convention Center. Military footwear has undergone a much needed evolution in the last decade with changes in tactical requirements and the introduction of new manufacturing processes borrowed from the athletic and recreational outdoor markets. These influences have evolved tactical footwear into new mission specific designs that provide the operator with comfort, maneuverability, stealth, performance and durability never available in military footwear. One of the leaders in outdoor and tactical footwear, Danner, showed a number of new designs that borrowed from their 75-year heritage while also showcasing new technologies in sole design, light weight and visual stealth. Danner has done an exceptional job of building modern mission specific footwear tailored to the individual operator’s mission while combining many traditional material and construction techniques. Danner's new DFA is an update to the tactical boot harkening back to the original Adidas GSG-9 but in a more durable platform with fast-rope specific features and a stealth sole. Danner’s new DFA tactical boot reminded us of the original Adidas GSG-9 special operations boot made famous by the German Federal Police Special Operations unit, Grenzschutzgruppe 9- but much better. The DFA is a tremendous evolution of early lightweight tactical boots with a full nubuc leather upper built over a Gore-Tex sock liner. The unique sole features a medial reinforcement of Vibram V-4 rubber for use during fast rope insertions. This fast rope specific feature called “Danner VIA” is patent-pending and makes rope descents smoother and braking easier even with a load. The outsole compound and low lug tread pattern optimizes audible stealth and traction on all floor surfaces, even when wet. An additional padded section on the medial ankle help protect the operator during fast rope insertions, dynamic entries and vehicle ingress/egress. The boot is impressively light weight and flexible due to the Pebax midsole plate and proprietary molding of outsole/midsole and upper. The Danner DFA is a strong option for police tactical units, Homeland Security, private security and other law enforcement and military units that require a long wearing, silent soled boot with fast rope and dynamic entry features. Danner's new ICH tactical mountaineering boot in two colors with a full Gore-Tex sock liner. Danner showed the new U.S. made, Berry compliant ICH boot. 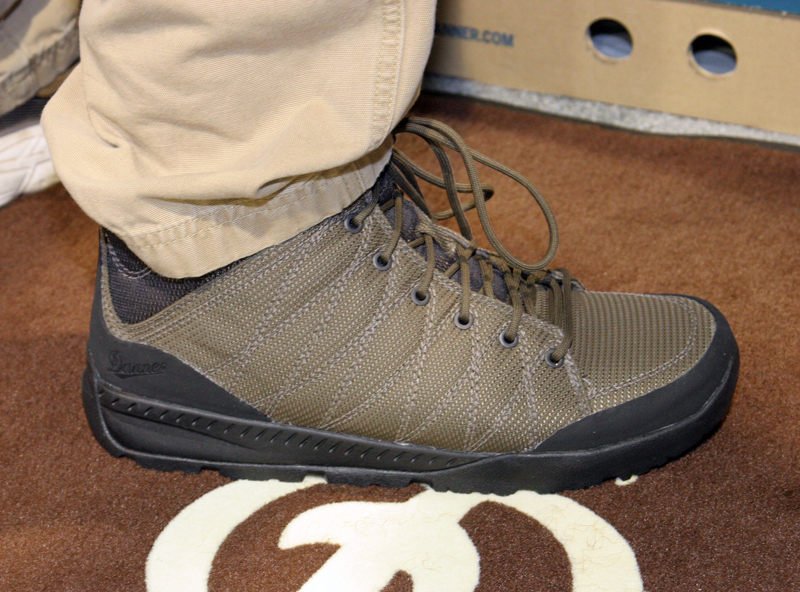 The ICH brings high altitude mountaineering design to tactical footwear. Danner used the Vibram Bifida outsole to maintain support, flexibility and comfort across a wide range of temperatures including extreme cold. The ICH uses a full Gore-Tex sock liner for weather protection. This will likely be a relatively flexible mountaineering boot compared to crampon-specific technical mountaineering boots. You will be able to hump heavy loads on mountain terrain for long hours in relative comfort with the ICH. Missing from the Danner ICH boot is any type of outsole/heel or toe groove for use with crampons, snowshoes or ski bindings. This may be because of its more flexible outsole/midsole for walking that does not translate well to crampon/snowshoe/ski use. The Mountain Assault Boot is a true soldier’s boot nicely configured for specialty mountain units, long range surveillance units and any application that includes high altitude, long distances and load carrying. There are two colors in the ICH, olive and tan. 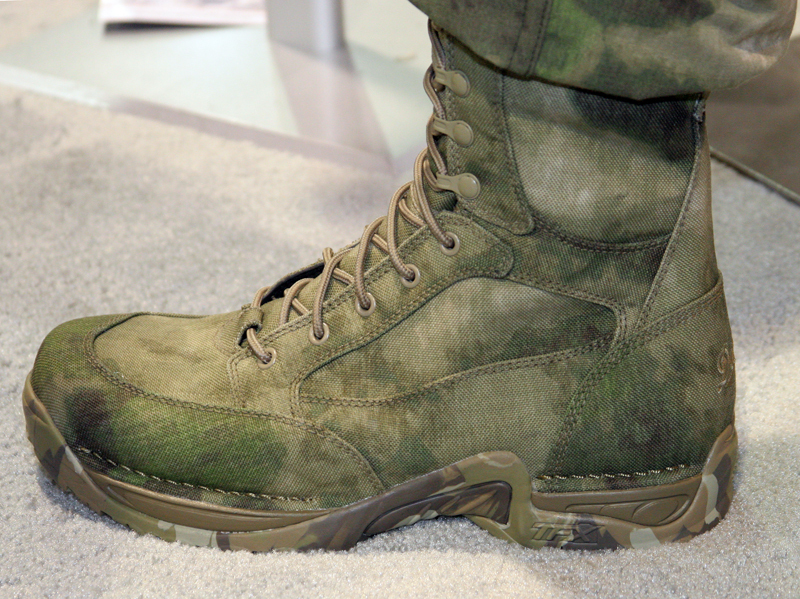 We got spy shots of prototype Danner boots in the new A-TACS FG woodland pattern. Note that this prototype boot has a new A-TACS FG color upper but the previous A-TACS (non-FG) sole. 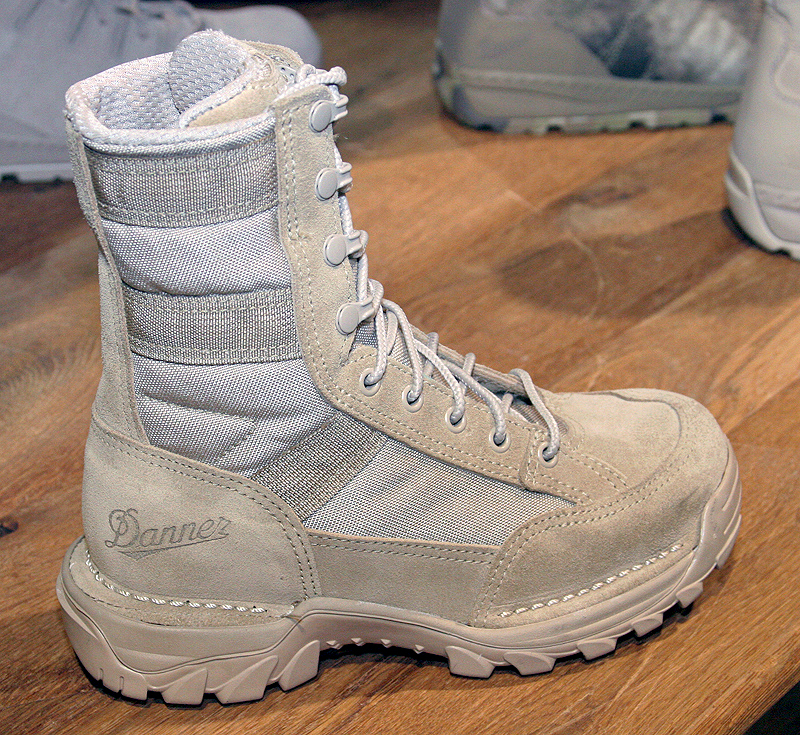 Danner is releasing a similar high altitude boot to the ICH in July 2012 called the Mountain Assault Boot. The Mountain Assault Boot will use a Pebax framework and Danner’s Dynamic Response System riding on the Vibram Tsavo outsole. The Mountain Assault Boot does have a molded in horizontal heel recess for crampons, snowshoes and ski bindings. The Mountain Assault Boot is to be sold in canteen color, a darkish brown. It is similar in appearance to the ICH but will provide a stiffer ride. 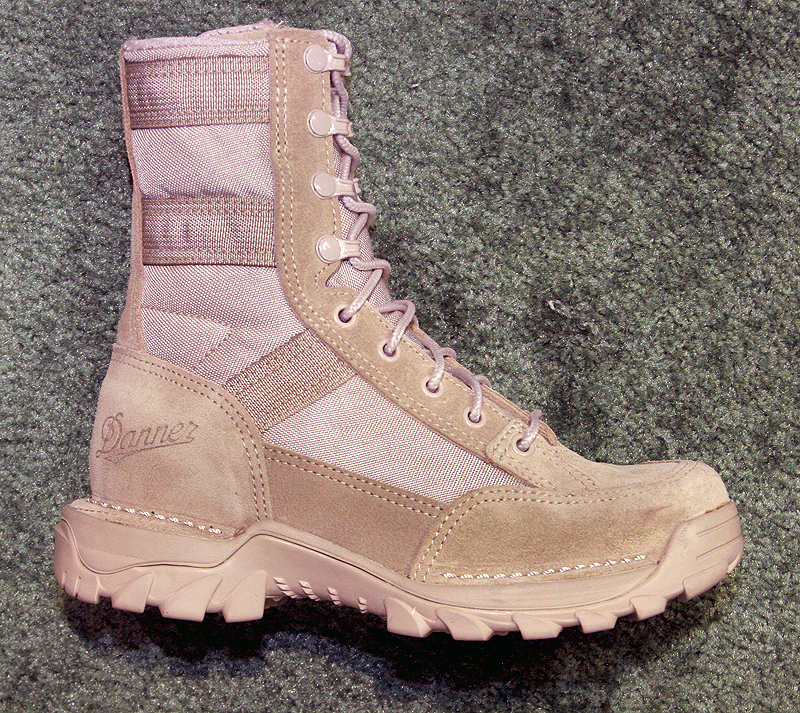 Lightweight boots with new camouflage schemes were shown in Danner’s booth with their new Melee line-up that includes camouflage models in Crye Multicam and A-TACS patterns along with solid canteen color, black and a very nice low quarter version in the canteen brown/green color. The Melee is a flexible fabric upper boot and shoe family available with either a waterproof Gore-Tex lining or a more breathable non-Gore lining. These new boots are packed with details like a convenient “lace garage” for tucking in your tied laces. Different models feature either waterproof full grain leather uppers (solid color boots) or a 1000 denier fabric upper on the A-TACS, Multicam and low quarter boots. A new low-quarter version of Danner's Melee in Canteen color with a 1000 denier nylon upper makes for a lightweight, comfortable and durable everyday low profile shoe. One of the most impressive boots in Danner’s 2012 line-up is the Rivot TFX. Rivot TFX is designed for the U.S. Marine Corps as well as other military unit, law enforcement and tactical outdoor use. The Rivot TFX is U.S. made and features a full Gore-Tex sock liner. The upper is 1000 denier nylon with Space Frame Webbing reinforcement built-in that is reminiscent of traditional jungle boot design. The lower portion of the boot is waterpoof rough-out leather that is durable and non-reflective. The welt construction, double reinforced toe, rough-out leather lower, drain holes (reminiscent of jungle boots) and Space Frame Webbing reinforcement on the Danner Rivot TFX. Lowa’s successful Task Force line continued with expanded colors including Air Force Grey and black in their popular Zephyr GTX and GSG Revo black tactical boot. We’ve worn Lowa boots for five years with excellent comfort, performance and durability. As we walked the floor at the SHOT show in Las Vegas we were wearing Lowa Task Force boots. Lowa's successful Task Force line has been expanded with more colors including an Air Force uniform color option. The unusual looking Lowa Monowrap exterior frame design wraps the outsole onto the upper for added stability and shock reduction. Monowrap remains a proven design that will continue forward according to Lowa’s Marketing Director. The Monowrap is a Lowa-owned patent that has been used for several years by Lowa in both their military/LE Task Force line and their civilian technical footwear. 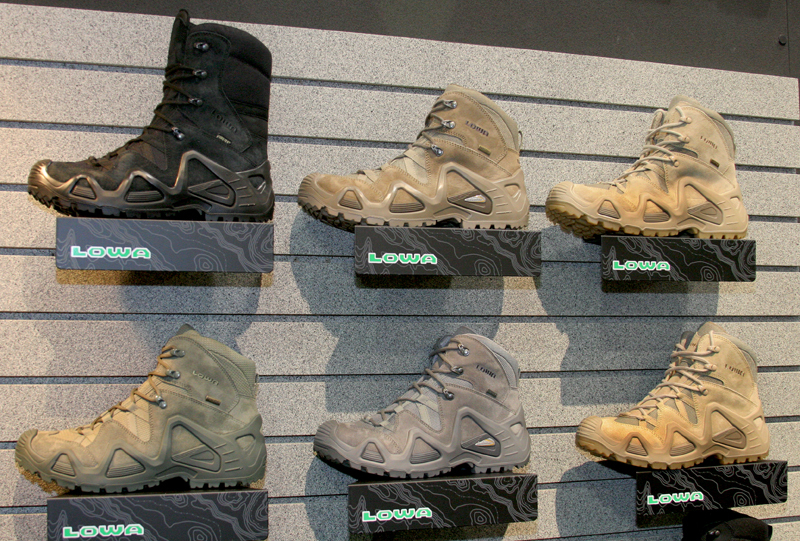 Lowa specifies their “Mid TF” boots are ideal for operators carrying up to 25 pounds of equipment. We’ve worn earlier versions of the Zephyr Mid Task Force boot with 40+ pound loads and excellent comfort and performance. A unique feature to the Zephyr Task Force boots is their seamless design to reduce hotspots. The company claims, and our experience confirms, the boots require no break in. The new sage green Zephyr GTX Mid TF and the black high-top GSG Revo with Gore-Tex sock liner. Magnum showed their successful Multicam boots including the Magnum Spider 5.1 HPi Multicam, an unusual low-quarter, light weight high mobility boot with a 1650D ballistic nylon upper and a grippy fast rope reinforcement. The Spider 5.1 HPi fits and feels like a very light hiker or a trail running shoe. While it may be a little low topped for uniform wear or bloused BDU pants it is a great option for when you have to move fast and light. It’s a joy to wear boots that are so light and maneuverable. The open vents in the forefoot make it a great hot weather choice. The Magnum Spider 5.1 HPi Multicam boot is a low quarter, lightweight boot with plenty of ventilation and super maneuverable feel. We love this boot for non-garrison wear. Magnum also showed Multicam trail running shoe called the Intrepid HPI (left photo above, background). The Intrepid HPI used a dual-density running shoe midsole and a unusual seamless upper to shed debris. The laces are anchored to an unusual clear polymer saddle frame. There is a breathable mesh tongue and a hefty toe reinforcement. We’ll be doing some trail runs in this shoe and will report our impressions. There was so much new and interesting footwear at the SHOT show they could have had a separate tactical footwear show. With so many new introductions and the ongoing evolution of tactical footwear it was one of the most interesting categories at the show. Our SHOT show coverage will continue here on MILTECHREV.com this week (1/24/2012).